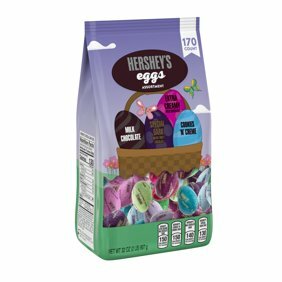 See all 🌷 Hershey's Easter Sweets 🌷 on Walmart.com. Save money. Live better. Get the creamy milk chocolate you know and love in a crunchy candy shell! Unwrapped and ready to eat, HERSHEY'S Candy Coated Milk Chocolate Eggs are perfect for sharing a simple moment of happiness this Easter. Ingredients: Milk Chocolate [Sugar; Milk; Chocolate; Cocoa Butter; Lactose; Milk Fat; Lecithin (Soy); PGPR, Emulsifier; Vanillin, Artificial Flavor]; Sugar; Contains 2% Or Less Of: Artificial Color [Yellow 5 Lake; Blue 1 Lake; Yellow 6 Lake; Red 40 Lake]; Corn Syrup; Cornstarch; Modified Cornstarch; Resinous Glaze; Carnauba Wax. Best Easter Chocolate Candy Ever! This is my favorite Hershey candy and it only comes out at Easter. I usually stock up, put dozens of bags in the freezer, and enjoy for several months. So happy I can now get it early online. Got my order and so happy. One fear was, if they arrive broken in pieces. They were packaged well. All is great. Thanks so much. I will buy again. It is a great deal, price and convenient.